Japanese pump manufacturer Ebara announced that it has installed drainage pumps at the Tsuruga Drainage Pump Station in the Nakatsuyama district of Japan, for the Ministry of Agriculture, Forestry and Fisheries. The region is one of Miyagi prefecture’s primary agriculture areas, producing rice, wheat and soybeans. Flood damage to crops has resulted in the need to install improved drainage facilities. Ebara has provided horizontal-shaft mixed flow pumps, including two pumps with a diameter of 2m, one with a diameter of 1.5m, and another with a diameter of 90cm. 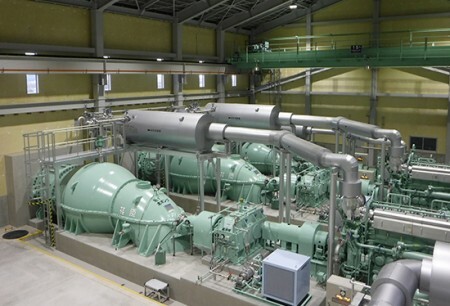 Combined, these pumps are able to handle 27 cubic metres of discharge per second. This new discharge volume is 1.8 times greater than conventional capacity installed at the Tsuruga pump station.